A single set of grading standards does not fit all coins in the Seated Liberty dime series. That's because it really isn't a single type. There are actually three major sub-types of Seated Liberty dimes. 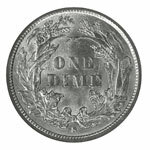 The early issues (1837-40) were coined from dies generated from distinctive obverse and reverse hubs unique to that period. These dimes came with or without stars, as this feature was added by hand to each working die. A new pair of hubs was created for the revised subtype of 1840-60 featuring drapery at Liberty's elbow and fully integrated stars on the obverse. A third major sub-type was introduced in 1860 when the stars were replaced with the legend UNITED STATES OF AMERICA, and this design remained in use through the series' end in 1891. The Official American Numismatic Association Grading Standards for United States Coins acknowledges in part the impact these design changes had on this series by offering two complete sets of grading criteria. These apply to the dimes of 1837-60 and 1860-91, respectively. The book includes several specific notes relating the peculiarities of certain date/mint issues, as well as a few general notes warning of the flaws common to many coins within this long series. 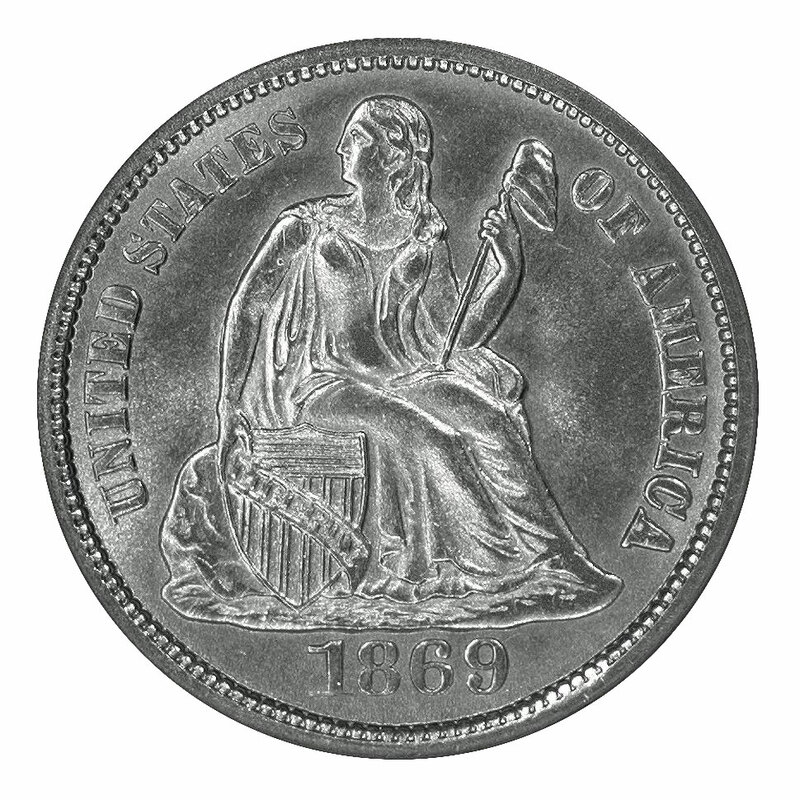 Seated Liberty dimes often are found with the features of Liberty's head not fully struck. This problem of metal displacement also is found at the lower part of the shield and at Liberty's feet. Another trouble spot is the top of the wreath directly opposite the base upon which Liberty sits, a fact especially true of the 1860-91 issues. These problems may not be evident on coins grading less than Fine but are factored into the grading of pieces in the higher circulated grades and in mint state grades. How much of a grade reduction occurs usually will depend on the severity and location of the weakness. Complete details to Liberty's head and a sharply defined mintmark are nice bonuses, but they have little influence on a coin's grade. Flatness in the lower part of the Liberty figure and at the top of the wreath is more obvious and may weigh against a coin when determining its grade, though sharpness of strike typically is not a major grading factor. Surface quality can be quite an issue with Mint State Seated Liberty dimes. Carson City Mint coins, particularly the rarely seen dates 1871-74, often have planchets that display varying degrees of porosity and uneven striking as made. This is pretty much ignored in the grading process, as it's understood that the coins simply come this way. A common date more readily found with sharp details might suffer a lower grade if it displayed such deficiencies. Luster is another factor which varies from one issue to another and must be considered when grading mint state coins of this type. The preparation of both dies and planchets tended to vary from mint to mint. 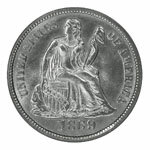 A Philadelphia Mint dime of the 1880s typically will appear brighter than a San Francisco Mint dime of the 1860s, yet both may qualify as gems. 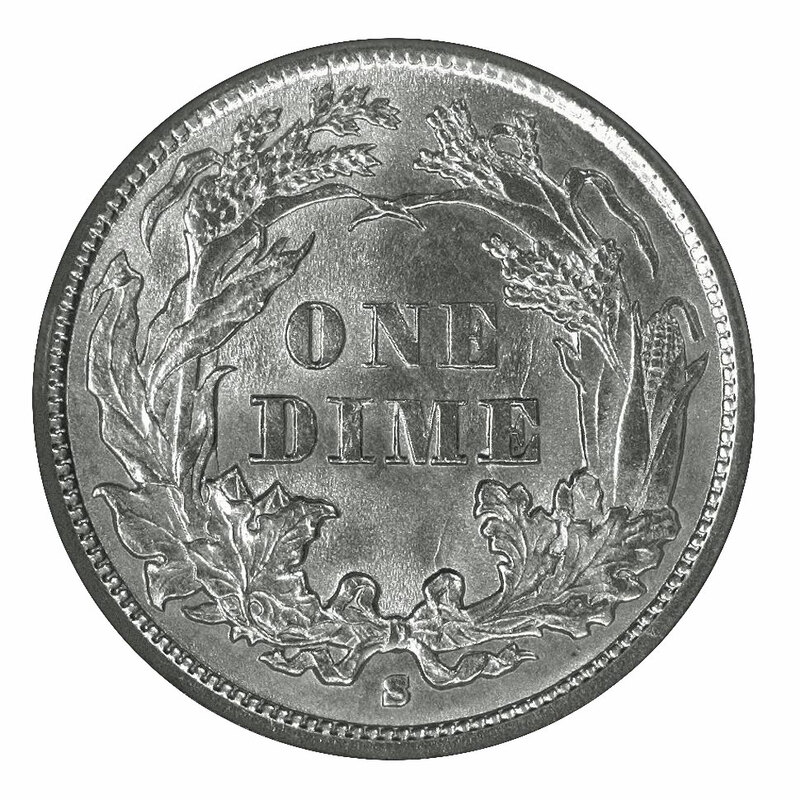 New Orleans Mint dimes suffered mightily from worn and cracked dies. Though visually distracting, these flaws did not necessarily impair a coin's luster. In fact, the erosive action of planchets wearing the dies and creating metal flow lines which reflect light in a shimmering pattern is the actual cause of what we call luster. Proof Seated Liberty dimes are distinctive from coins made for circulation in that their dies were highly polished and rarely revealed any metal flow lines. Thus, the fields of proof dimes are brilliant rather than lustrous. The die cavities, however, were quite frosty, and this contrast resulted in the highly appealing "cameo" look of these vintage proofs. A brilliant surface is far more sensitive than a frosty one to impairments such as nicks and "hairlines," so a stricter standard of grading applies to proof coins. While a dime grading MS-60 can be reasonably attractive, a Proof-60 coins is apt to be unappealing.